Infographic: How Much State Debt Rests on Your Shoulders? How Much State Debt Rests on Your Shoulders? We’ve previously shown the federal government debt incurred per person in each country, but today’s infographic drills down to the state level. How much state debt is there per person, and why is there such a wide discrepancy between states like Massachusetts ($11,000 per person) and Nebraska ($1,000 per person)? 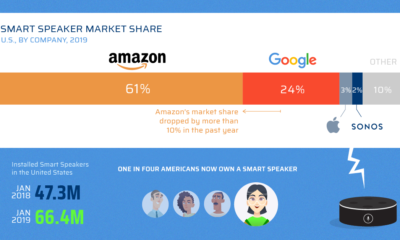 Today’s infographic from HowMuch.net, a cost information site, organizes states by debt per capita using a snowball-like effect. The five states at the center of the snowball with the highest debt per capita are Massachusetts ($11,000), Connecticut ($9,200), Rhode Island ($8,900), Alaska ($8,200), and New Jersey ($7,400). On the other end of the spectrum are the five states with the lowest state debt per capita: Tennessee ($900), Nebraska ($1,000), Nevada ($1,200), Georgia ($1,300), and Arkansas ($1,500). While it is reasonable to expect big differences in debt per capita between countries, seeing an interstate difference of up to 10x per person seems a bit perplexing at face value. Let’s see if we can dig a little deeper on what accounts for these differences. 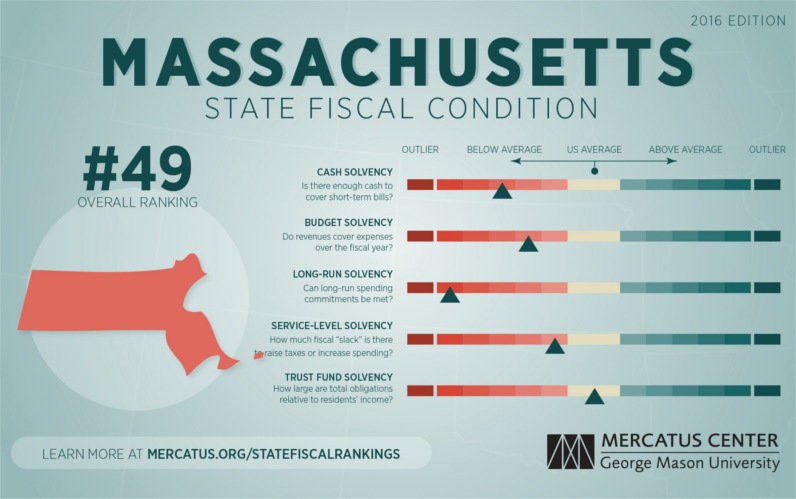 Currently, Massachusetts holds the title of the highest state debt per capita, as well as ranking #2 in terms of state debt as a percentage of GDP (14.0%). It’s also worth noting that debt analysts at S&P have recently lowered the outlook on state bonds from stable to negative. Like other old and urban states, Massachusetts requires significant investments to repair aging roads, schools, and other infrastructure. For many fiscal analysts, however, it is the gap in unfunded liabilities that is the long-term concern. Forbes notes that unfunded liabilities from public pensions are probably the biggest fiscal problem facing state governments today, and Massachusetts is no exception. Unfunded liabilities in the state are pegged at $94.45 billion with other postemployment benefits (OPEB) at $15.38 billion, and eventually these are issues that will have to be dealt with. What does a healthier state budget look like? The best examples can be found in the Midwest. Nebraska exhibits strong fiscal health across all categories. On a cash basis, Nebraska has between 3.81 and 5.02 times the cash needed to cover short-term liabilities. Revenues exceed expenses by 7 percent, producing a surplus of $294 per capita.